Having volunteered at WEN for the past few weeks, I have been incredibly impressed to discover the dedication with which every campaign has been fought. Looking to find out more about WEN’s work on waste, I picked up a box with a relevant label, opened the first folder and was faced with this note in red capital letters: “WASTE MIN. ACT ARCHIVE. 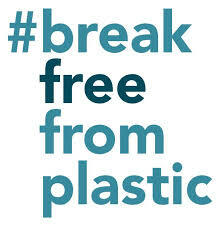 V. IMPORTANT DO NOT DESTROY”. I struggle to explain the excitement I felt when I realised the importance of this folder: it contained an original copy of the Waste Minimisation Act 1998, which was initiated by WEN, and gave local authorities the power to take preventive action to minimise waste. More importantly, the content of the folder told the story of how a group of activists initiated a bill that successfully became law, in support of their environmental campaigning. Newspaper cuttings, interviews, letters from MPs, different bill versions and copies of parliamentary debates together review the process through which WEN activists spotted a gap in the waste legislation, decided to act and pushed a bill through Parliament to ensure change would happen, supported by a clear legal framework. You don’t need to have studied law to know that the process of passing legislation is long and tedious, but this group of women and especially one woman – Ann Link, whose role seems to have been instrumental in pushing the Act through its parliamentary stages – demonstrated how successful policymaking can be done, so I thought I would share with you a few their tips. The Real Nappy Campaign was also underway, promoting the use of reusable cotton nappies and encouraging the development of local laundering services to minimise waste. Benefitting from a close relationship with local authorities and its access to local knowledge, WEN soon spotted a gap in the law: while local authorities were in charge of waste management under the Environmental Protection Act 1990, they had no legal authority to tackle the problem at its source or to implement measures on waste minimisation in the first place. Local authorities that wanted to be more ambitious with their waste reduction objectives, by setting up re-usable nappy schemes for example, were halted by the fear of acting ultra vires (outside the scope of their legal authority). So WEN decided to get a law passed that would give local authorities the powers they required: it would impose no obligations on local authorities but have an enabling effect, providing them with funding to support local low-waste initiatives. In an article from December 1995, WEN’s press officer Helen Eldridge explained the motivations behind this new bill: the Waste Prevention Bill. The Bill gathered 239 signatures and got through the Committee Stage. It was presented again by Gary Waller MP in March 1996, but then lost as it did not pass before the 1997 General Election. Despite this setback, the Bill maintained its cross-party support as well as backing from Friends of the Earth, Waste Watch, the Institute of Waste Management and many local authorities. In June 1997 Michael Meacher MP, Minister for the Environment wrote to WEN’s Waste Prevention Coordinator Ann Link with an optimistic and supportive message, stating that the Government would support a re-introduction of the document by a backbencher in Parliament, as the Waste Minimisation Bill. WEN appealed to Piers Merchant MP who got a place in the Private Member’s Ballot (the right for a backbencher to present a bill to Parliament) and accepted to be a sponsor. The Bill was widely accepted but left sponsorless when Piers Merchant resigned following a personal scandal. Responsive and determined, Ann Link nevertheless found a new way to carry the Bill through: she contacted Angela Smith MP for Basildon who re-introduced it as a Presentation Bill (simply introducing the title without speaking in support of it). The Bill successfully made it through its first two readings then continued promisingly through the next parliamentary stages. 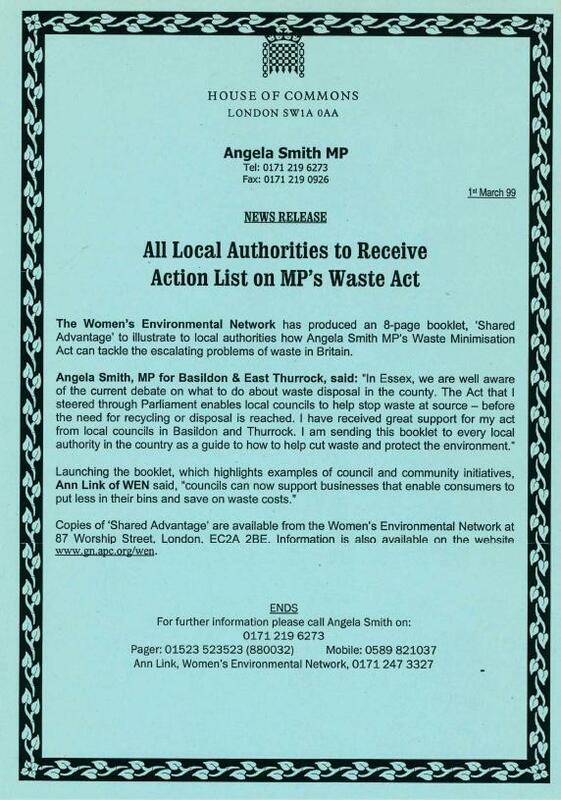 In July 1998, Angela Smith MP sent a letter to Ann Link after the Bill successfully passed its Third Reading, recognising the central role WEN had played in ensuring the Waste Minimisation Act became law. The Act succeeded in the remaining parliamentary stages and received Royal Assent on 19th November 1998. A lot of the press cuttings I found retrace the progress of the Bill through Parliament and set out the situation which the legislation sought to change. However some of the most important articles were those covering the impact of the Act. All over the country, waste minimisation initiatives were undertaken as a result of the Waste Minimisation Act being passed. An example of this was in Mid Sussex, where the Council started collaborating with a laundering service delivering fresh nappies and offering a council tax rebate to the families using cotton nappies. The Council’s Recycling Officer attributed the initiative to the recent Act ‘which allows councils to contribute to the expenses of waste minimisation’. From the outset of the campaign, WEN had prepared a list of initiatives which Local Authorities would be able to undertake thanks to the Act, such as rewarding low waste restaurants and businesses, encouraging the use of reusable cups and materials at public events, promoting laundry services for nappies or setting up repair schemes for household appliances. After the law passed WEN supported local authorities through the process of implementation by promoting the exchange of information on waste prevention. WEN published briefings such as 'Shared Advantages', compiling lists of projects and services to avoid and of companies willing to work in partnerships with local authorities to reduce waste. WEN also gave talks to local councils on ways to promote low waste initiatives and published ‘25 Waste Prevention Ideas for Local Authorities’ in 2001. Clearly WEN’s approach to policymaking is much more than the few points I have tried to narrow it down to. The Waste Minimisation Act campaign was successful due to the constructive and holistic way in which WEN women interpreted the issue. Through building strong relationships and dialoguing with the different stakeholders involved, WEN understood the roots of the problem and identified the actors who would be key in finding a solution: local authorities, citizens and MPs were all addressed individually. I am not going to compare the woman’s fight for suffrage to a campaign to get a waste minimisation bill through Parliament, but it is undeniable that the movement inspired generations of activist women. Whether we are campaigning for suffrage or fighting to protect the environment, it is an inevitable conclusion that change occurs through action and often through legislation. Accepting this, the women at WEN worked through the system, got in touch with key allies and found innovative ways to get the Bill through Parliament, overcoming legislative and administrative hurdles along the way. They showed both determination and perseverance without which no change could have happened. The positivity of WEN’s approach carried the campaign through, as the minimisation of waste was seen as an opportunity to seize rather than a burden to bear: a way to save money, boost local services and provide local employment while avoiding extremely damaging impacts on the environment. Ann Link explained it in this way: ‘Waste reduction is not just about companies consuming less – it can mean creativity, new services and enterprise’.